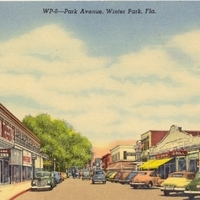 Postcard showing the southern end of Park Avenue in Winter Park, Florida. On the left is the Colony Theatre built in 1939. Park Avenue is Winter Park's historic main street. Originally located at 329 South Park Avenue, the Colony Theatre opened in 1939 and became a regional attraction in the 1950s and 1960s. The theater closed on September 28, 1975 and renovations of the building took place from 1976 to 1977. The site re-opened as the Colony Gardens in 1978. The building is now occupied by Pottery Barn. Digital reproduction of original color 5.5 x 3.5 inch color postcard by Genuine Curteich-Chicago: Orange News Company, Orlando, Florida. Originally created by Genuine Curteich-Chicago and published by the Orange News Company. Chamliss, Julian. "Placing Memory, Exploring Context: Winter Park's Colony Theater." Academia.edu. http://www.academia.edu/541573/Placing_Memory_Exploring_Context_Winter_Parks_Colony_Theater. "The Early History of Winter Park." Winter Park Historical Association. http://www.wphistory.org/explore-history/winter-park/early-history. "History." City of Winter Park. http://cityofwinterpark.org/Pages/Government/City_Info/History.aspx. "History of Winter Park." Experience Winter Park Avenue. http://experienceparkavenue.com/history-of-winter-park/. "Park Avenue Story." Experience Winter Park Avenue. http://experienceparkavenue.com/about/park-avenue-story/. WP-8--Park Avenue, Winter Park, Fla.
Genuine Curteich-Chicago. “Park Avenue Postcard.” RICHES of Central Florida accessed April 23, 2019, https://richesmi.cah.ucf.edu/omeka/items/show/1385.